Have you seen Black Swan? I have enjoyed most of Darren Aronofsky's films, and thought this was excellent too. 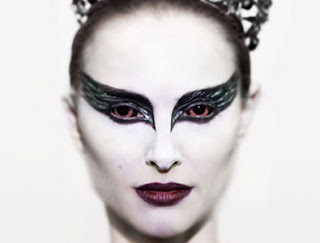 The photography, sound design and acting were all impeccable: the scene of Natalie Portman's adoption of the black swan's mannerisms were thoroughly convincing; the few seconds of her expression as she walked from the stage a study in mesmerising sexuality and alien expression. The film also appealed because some of the subject matter was about the influence of art on life, and how for some people art has no relevance, but for others it can be their compulsion and central focus for living. The scene in a bar with a man who knew nothing about Swan Lake reminds us that for some the only art is entertainment. Cold Fusion 2000's protagonist interprets his life in terms of poetry; Mark from 2000 Tunes does the same with music. Art gains meaning through adoption. The film made me cringe in parts, in a way that horror films don't. The visceral impact of a bloody broken toenail or torn hangnail as filmed in this way can be far worse than the exaggerated gore of an entertaining horror film (or even my own thriller Turner, which I see as thoroughly entertaining escapist fantasy rather than disturbing horror). I found Black Swan hard to watch. Too dark, no pun intended. I totally understand - I had a hard time myself, and I can handle some grim stuff!